Apartamentos Vista Playa I-II Valencia Costa Del Azahar in Cala Blanca. This Self Catering Apartment Accommodation by the beach in Valencia - Costa Del Azahar on the , has a swimming pool, is close to the beach. Prices from 31.5 EUR. Welcome to the Apartamentos Vista Playa I-II Valencia Costa Del Azahar.These typically Balearic-style apartments overlook their own outdoor swimming pool â?? the ideal place to enjoy the peaceful surroundings of western Minorca and the Mediterranean sunshine. For more on this Self Catering Apartment Accommodation by the beach in Valencia - Costa Del Azahar on the please click on the availability buttons above and below. The Apartamentos Vista Playa I-II provides excellent Self Catering Apartment Accommodation in Cala Blanca, Valencia - Costa Del Azahar, Spain. 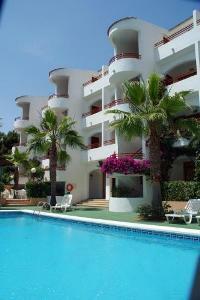 The address is Avenida de la Playa S/N Urb.Cala Blanca, Cala Blanca, 7760.